Every year since 1989, I put away my palette and brushes for a few weeks to work on our family Christmas tree farm, Victorhill Farm. We begin selling U cut trees the week before Thanksgiving, then remain open every day until we run out of sellable trees. Sometimes we remain open all the way until Christmas, but this year, due to huge crowds (thank you everyone) for two weekends in a row we ran out of trees early on and were closed by the second weekend in December. Each year my art studio is transformed into a wreath and gift shop where we make fresh wreaths, sell ornaments and artwork. It used to be my job to make all the wreaths, but now Erica is in charge of production, while I make bows, decorate wreaths, organize the gift shop and most importantly make sure our visitors are well taken care of. Here are a few photos to show you what it's like in the wreath shop/art studio between Thanksgiving and Christmas. 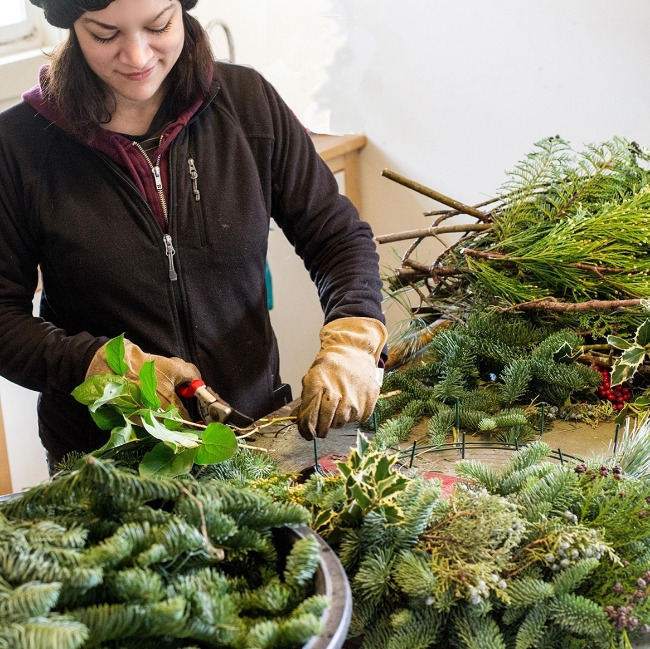 A few of the more common types of greens that go into the wreaths, incense cedar, juniper, noble fir and variegated holly. A fresh traditional wreath hanging in the studio gift shop. I made a quick, less than 20 seconds, video for you so you can get a better idea of what our farm is like. Hope you enjoyed this little tour. Next more photos from the farm. I love reading your comments, so here's a question to get you started. Do you put up a tree during the holidays? If so, where do get it .... already cut from a tree lot, cut your own tree from a farm or carry down from the attic in a box?